It’s widely known that Instagram has a tremendous marketing power. If used correctly, you can achieve results that you can only dream of on other platforms. Instagram has gone from an app that was considered to be “something for the kids” to now play a central role in some of the largest corporates’ in the world’s social media strategy. On Instagram, you can find brands like Volkswagen, Nike, Gucci, Louis Vuitton, Apple, and many more. One thing we can say with almost 100 percent certainty is that they wouldn’t be using Instagram if they didn’t believe in it and if it didn’t generate any results. In this article, we’ll study Instagram statistics related to marketing on the platform, and statistics that describe why Instagram is so tremendously effective for brands to use. 90% of Interbrand companies have Instagram accounts. 70.7 percent of businesses are expected to use Instagram in 2017. The popularity among businesses to use Instagram is increasing dramatically, and the only explanation is that Instagram actually works in marketing! If you haven’t yet made Instagram a part of your marketing strategy, now is the time. The competition will only be tougher, meaning the organic reach will decrease, and you will have a harder time establishing a strong presence on the platform, compared to your competitors that have been doing it for several years. Instagram marketing posts clearly have convincing and impacting power, and you’d be missing out on great opportunities if you’re not using them. If you want to drive traffic, increase brand awareness and ultimately drive sales, Instagram is your answer. 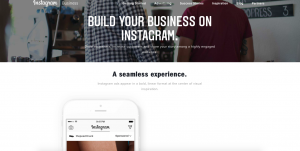 There are over 15 million registered businesses using Instagram business profiles. Since Instagram released their business profiles in June 2016, the number of them has increased explosively. The Instagram business feature was greeted with lots of praises from brands who were using Instagram because it introduced several new features that made marketers’ job easier and more effective. The Instagram business profile update introduced Instagram’s new analytics feature and new call-to-action buttons in the account’s profile, allowing customers to contact and approach them easier. This highlights the importance of having a consistent visual theme and style, and obviously, it seems to be working for a lot of brands too. These are the call-to-action buttons that are available to add to your profile when you’ve converted your profile to a business account. The call-to-action buttons encourage users to proceed to learn more about the business, thus making them more engaged. Instagram first began testing sponsored posts in late 2013 in the US with brands including Michael Kors, General Electric, Levi’s, Lexus and Ben & Jerry’s. A lot has happened since 2013, and what was just a test with a few selected brands have grown to something a lot bigger. This brings us to the next point. There are 1 million advertisers on the platform, an increase of 400 percent year over year. That’s a crazy number! Instagram is adding advertisers to their platform rapidly, and a lot has to do with Facebook owning Instagram, and current Facebook advertisers looking to expand their marketing on Instagram as well. What’s more, Instagram and Facebook use the same ad interface which makes the process of creating ads on Instagram familiar to the people who have created Facebook ads, thus also more appealing. Eighty percent of people on Instagram follow a business. If you can identify and reach your target audience, they can follow you too! Getting your audience to follow you on Instagram is a great way to reach them organically, and be able to impact them time and time over, without having to pay a single dollar for ads. Instagram is a great platform to educate your audience about your product and that it exists. Just create a clear strategy on how you’re going to reach them, and you’ll be able to create stunning visuals and posts to let your followers know more about your brand. People remember 80% of what they see and only 20% of what they read, and only 10% of what they hear. 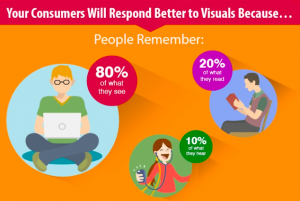 This is why Instagram’s visual content is so great for marketers and brands because they leave a long-lasting impression on their customers. Instagram’s engagement rate is still extremely high compared to other social platforms – especially Facebook, so if you’re looking to get as much free exposure as possible, only investing your own time and effort, Instagram is for you. By developing a clear and thorough strategy, you can generate amazing results only by the organic reach, however, a boost from paid advertising doesn’t hurt either! The top 200 global brands received the highest engagement on product posts. This is good news for marketers because it means that people who follow brands on Instagram are prepared to see a lot of posts around your products. In fact, that might be the reason why they are following you. is great news for marketers since people who follow brands on Instagram are aware and accept the fact that they’re going to be exposed to products. In other words, you don’t have to be too worried about it seeming like you are shoving ads down your followers’ throats because the truth might actually be that they like to see posts about products. It’s not enough to share a post whenever you feel like it, or to let your page sit and rot for weeks in a row. To generate the results you are seeing other brands achieve in the listed statistics, you need to post regularly and often. Having a social media content strategy in place will make your job a lot easier, allowing you to produce better content in a shorter period of time. The statistics speak very clearly. If 36% of B2C brands say that Instagram is very important or important, there’s a good reason to it. And let me tell you, it’s certainly not because it generates lousy marketing results. If Instagram wouldn’t hold any marketing power, they wouldn’t consider the platform to be important, and they certainly wouldn’t be using it. Instagram is set to gain $4 billion in mobile ad revenue 2017.
eMarketer expects Instagram to generate $2.8 billion in ad revenue in 2017. Instagram makes its money from advertising, just like Facebook, and they’re heavily dependant on it. In fact, in 2016, about 97% of Facebook’s third-quarter revenue was derived from ads. Facebook’s ad revenue for that quarter was $6.82 billion, which is a 59% increase from the same quarter the year before. Facebook doesn’t disclose how much of that revenue Instagram is generating, but using the numbers as indications, it is a lot. but if the numbers it does provide are any indication, it’s a lot. As you saw on the two stats above, the numbers are clearly varying, and one thing is for sure: only time will tell. 71% of U.S. businesses are on Instagram. The more you wait with implementing Instagram into your strategy, the more you’ll regret, because the harder the competition will be. 80% of users follow 1 or more brands on Instagram. There’s a clear interest in brands on Instagram, and this is positive news considering the high supply of brands on the platform, as seen in the statistic above. Chances are, many of your customers expect you to be on Instagram and take it for granted that you are. But if you aren’t on the platform to meet their wishes, requests, and interact with them, you’re missing out on one hell of an opportunity. 70% of hashtags on Instagram are branded. This is something highly important that you want to take note of. Hashtags are extremely effective to gaining more visibility and encouraging others to join in on the conversation. This statistic tells us that brands have done a great job in getting people to start using branded hashtags to join the conversation.